- Screen flipping/ordering does not occur if only one screen is visible. replaced with explicit "colour" parameter to all draw methods. PackedFontBase, making FontBase data free. - Minor tidying in gadget.cpp. - Removed constructor from FontBase. - Gadget::checkCollision(Gadget*) now accepts a const Gadget*. - Replaced Gadget::swapGadgetDepth() with Gadget::changeGadgetDepth(). - Rewrote Gadget::swapDepth() to be more intelligent. by swapDepth() instead of the parent's swapGadgetDepth() method. - Minor tidying and optimisations. - Gadget::_decorationCount is an s32 instead of a u8. - Fixed array index confusion in RectCache::markRectDamaged(). - Fixed bugs in Graphics::floodFill(). - Removed static variables from Woopsi class. - Removed unused Gadget::GADGET_NO_RAISE_EVENTS flag. - Removed redundant Woopsi::goModal() method. 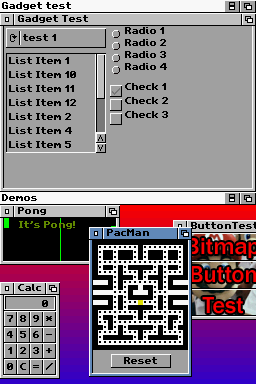 - Replaced AmigaScreen-specific flags with extra constructor parameters. - Replaced AmigaWindow-specific flags with extra constructor parameters. lowered to the bottom of the screen stack (ie. only one screen). - Removed concept of "close type" from Gadget. - ProgressBar accepts a style object in its constructor. - Removed GadgetFlagTypes from Gadget class. - Removed flags from all gadget constructors. - Changing label borderless state correctly repositions text. - Label redraws minimal amount when text is changed. - TextBox redraws minimal amount when cursor moves. - moveChildToDeleteQueue() renamed to moveGadgetToDeleteQueue(). - moveChildToShelvedList() renamed to moveGadgetToShelvedList(). - moveShelvedToChildList() renamed to moveShelvedToGadgetList(). - removeChild() renamed to removeGadget(). - getChild() renamed to getGadget(). - getChildCount() renamed to getGadgetCount(). - closeChild() renamed to closeGadget(). - shelveChild() renamed to shelveGadget(). - Added Bitmap copy constructor.